Home Microsoft Outlook Where Did My Reading Pane Go in Outlook 2013? 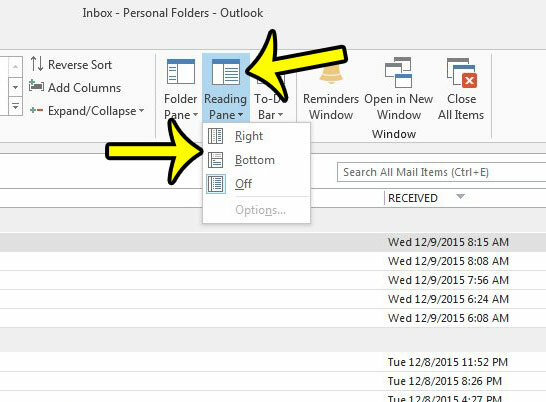 Where Did My Reading Pane Go in Outlook 2013? 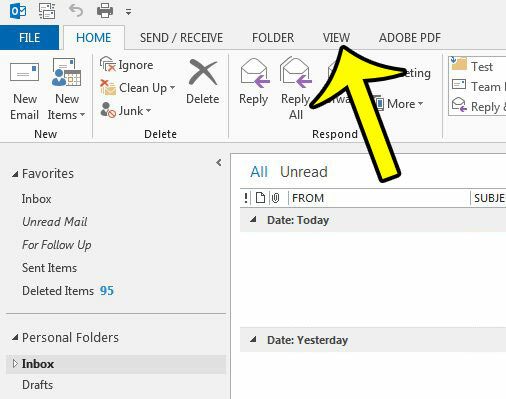 If you open Outlook 2013 and find that all of the email messages in your inbox are displayed as a list, and the window that typically shows a preview of the selected message is gone, then your Reading Pane may be turned off. This can be a little jarring when you are used to Outlook appearing the same way when you open your computer. Fortunately Outlook has options that allow you to configure how the different panes within the program are displayed, so you can follow our guide below to learn how to re-enable the Reading Pane and restore Outlook to its normal layout. The steps in this article will assume that your reading, or preview, pane is not currently visible in Outlook 2013. By following these steps you will restore the reading pane in Outlook so that you can read the content of your email messages without needing to double-click on each message. The steps below will require the ribbon to be visible in Outlook 2013. If you do not see the navigational ribbon and are having trouble finding the settings identified in these steps, then learn how to display a hidden ribbon in Outlook 2013. Click the Reading Pane button in the Layout section of the navigational ribbon, then click the Right or Bottom option, depending upon where you would like the Reading Pane to be displayed. You can also use this menu location to customize certain aspects of the Reading Pane by clicking the Options button. 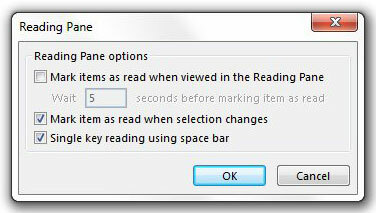 This will open a new window where you can modify certain settings about the Reading Pane. Do you have contacts that insist on sending read receipts, and you are tired of always deleting or ignoring those receipts? Learn how to disable read receipts in Outlook 2013 so that you no longer get the notifications that one was sent with your message.